Jonathan Yip, Head of Investment Grade Credit, Global Fixed Income, discusses the benefits of floating rate notes in the current environment, what makes the Allianz Global Floating Rate Notes Plus fund different from its competitors and the team behind the fund. A floating rate note is essentially a bond with a variable coupon that is based on a reference rate, short-term reference rate such at Libor of the federal fund’s rate, plus a spread, also known as the discount margin, which remains constant. The coupon resets usually every quarter, semi-annually or annually, and this is important because that means the duration is very minimal, which alleviates one of the major concerns in the market of rising interest rates impact on fixed rate bonds. The spread component is linked to the creditworthiness of the issuer. So for very high quality issuers this could be as low as 20 to 30 basis points, or for very high quality or high yield issuers, this could be as high as 400 to 500 basis points, or even more. Floating rate notes clearly benefit from a rising rate environment, which we currently are in in the US, where the Fed has increased rates by six times since 2015. And according to our projections we believe they’re going to hike at least another three to four times through 2019, which is actually much more benign than their own forecast, where they project they’re going to increase rates six to seven times through 2019 and even 2020. So as interest rates rise so will the coupon of floating rate notes. This is important as this hedges and actually benefits from rising rates and inflation. Even in a low interest rate environment, which we’ve been in for many years now since the financial crisis, today’s yields with Libor at roughly 2.3, 2.4%, and rising. That produces a very attractive proposition for an investor, even if rates remain lower for longer. Our offering produces three unique features: one, it’s global, we can invest in the US, Europe, Asian, Latin America; two, flexibility, we can invest in investment grade, high yield, emerging markets, securitised; lastly investment grade risk profile. So whilst we can invest in high yield, the overarching theme is a strong investment grade rating producing stable cash plus type absolute returns. When we launched this product we looked at the universe and found two widely different spectrums. One was either very short-term money market rates or two was high yield or CLO type products. There are very few if any truly global floating rate products that offer a yield somewhere in between the risk free rate and high yields, without taking much incremental credit risk. The team has over 30 years of managing global floating rate notes. Our group was one of the pioneers of global fixed income investing back in the 1980s, and we started investing in the credit world back in the 1990s when the global credit markets incepted along with the euro in 1999. We currently manage 38 billion of fixed income assets, of which two billion is in floating rate notes. 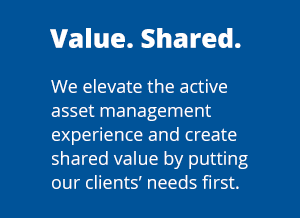 We also regularly interact with Allianz Group investors’ wider, over 700 investment professionals, managing over 230 billion fixed income assets across the world. A normal money market product is just trying to produce the risk free rate plus maybe 20 to 30 basis points, so very safe government like returns. They also typically can invest in fixed or floating rate bonds, and are usually very regionally focused, so either the US, Europe or Asia. Our fund is global, so it compromises US, Europe and Asia diversified, and has a spread target of 100 to 150 basis points, which in today’s yield environment with three month Libor current around 2.3-2.4% we’re producing a steady stable yield of currently around 4% plus. The risk profile of the fund is required to be investment grade, with a maximum volatility of 3%, with an objective of minimising drawdowns and producing stable cash plus type absolute returns, with an overarching winning by not losing credit philosophy.